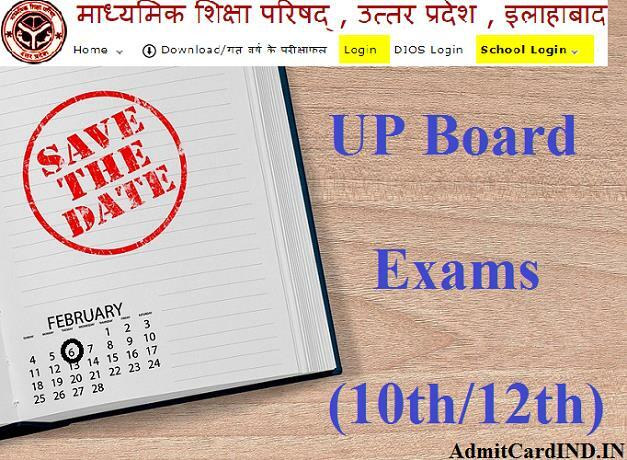 After pre-board exams, the UPMSP 2019 Admit Card for High School & Inter Annual Exams is going to be available for all recognized school/colleges of U.P Board. A composite date-sheet for the Final/Improvement/Compartment Examination of High School (10th) and Intermediate (12th) Classes has been posted on Uttar Pradesh Secondary Education Council’s Website. From February 06, U.P. Board may announce the conduct of both X, XII Class Examinations in two separate shifts. The timings for Morning Shift shall be from 07.30 AM to 10.45 AM and Evening Shift from 02.00 PM to 05.15 PM. The date to download and print UP Board Admit Card online has also been tentatively released in the due time. It is proclaimed that a candidate shall be able to grab his/her roll no from 25 January, as per the last year’s schedule. Before the theory exams, the individual marks for practical examinations are also supposed to be published online and later the full and final result for UP Matric & Sr. Secondary Classes should come online by April/May 2019. Together with the announcement of results, scholars must be provided with the Provisional Certificates. And an award of Mark Sheets for Tenth, Twelfth Standards should be organized subsequently as per the schedule. News & Updates: According to the newly released information on India Today (News Website), Aadhar Card is not a mandatory document to carry at the center of examination, said Neena Srivasta (U.P Board Secretary). However, it is a need while doing a registration. Moreover, It will likely to be a compulsory document from 2019. The first time ever, 6 Million registered students (Including Regular & Private) are there to compete with each other in Uttar Pradesh Board’s Exams that are going to be held in Feb/March. A district-wise list of the prescribed exam centers of the state has been uploaded to the authority’s website to download anytime. Candidates may get to know about their venue of examination along with the other essential things like Board Exam Scheme, Syllabus, and detailed curriculum. It was never expected that U.P.M.S.P will start carrying out the board exams this early. Seems like the officials are overcoming the previous failures. As this board used to be a famous one in terms of canceling and postponing the exams. But like there is a saying that “Time Heals Everything” so we appreciate the board’s strong movements. Students associated with especially Inter Class Subjects like Arts, Commerce, Science, Vocational etc have a high time opportunity this time as they shall get their final exam results on time. So, this time they will apparently have enough time to think about the admission into higher study courses. As far as UP 10th | 12th Admit Cards are concerned, these should be issued via online through the official website of UP MSP. Scholars from the regular classes need not to worry about its procurement as the concerned principal should take the responsibility to provide you with the same. To download admit cards in Mobile, candidates can open the download link and can enter their registration details – Application No, Date of Birth etc. Following are the points that can keep into consideration while getting the exam call letters. You may directly click on the below link for downloading the U.P. Class X/XII Admit Card. Choose class wise/name wise/school wise roll no’s as per the given options. Enter User ID, Password, and a security code to generate the Pravesh Patra. Hit log in and wait for a few seconds. Finally, the roll no/call letter would appear. Take a print out to be secure. I have lost Up Board admit card. How to download it? Dear students, if you have lost your Class 10th OR Class 12th admit card, you must contact your school/college in the first place. However, if you are not a regular student then you must contact the UP Board Officials for the same. And the helpline number for official Admin Department is 0532-2623139. Can I see Model Paper & Important questions for UP Board Exams? And the answer is yes. You all can now download the model paper list from the below download links. The Board of Uttar Pradesh, Prayagraj has released the UP Board 2019 Paper List and notes for High School & Intermediate Exams. Concerned scholars can obtain UP Board English/Hindi medium model paper as per the availability of various subjects & books like English, Hindi, Maths, Biology, Social Science, Chemistry, Physics, History etc. For extra coaching, one can join online classes to fulfill the preparation needs. Admit card bhejiye, roll no kese dekhe. sir, we are trying to get it but not able to do so. Admit card kab tak aane ki umeed lgayi jaa sakti hai ji.